Just a reminder that if you want to have a display of bulbs in your garden next spring now is the time to visit your garden centre or place your order with a bulb catalogue. We must not fixate only on the rare and difficult as there are many very beautiful bulbs available for an unbelievably low price. Now to one of my favourites, Crocus vallicola, ('valley dweller') - it is never likely to appear for sale by the basketful as it likes cool moist growing conditions and dislikes drying out. The lovely white petals terminate in a thread like wisp (acuminate) which often intertwine stopping the flower from expanding fully. The flower in the centre shows this as it resembles a light bulb in this entwined state; the pressure to open will cause the flower to pull apart adopting its elegant goblet shape. In my best forms the inside is stylishly marked with violet lines and two yellow dots at the base of each segment. 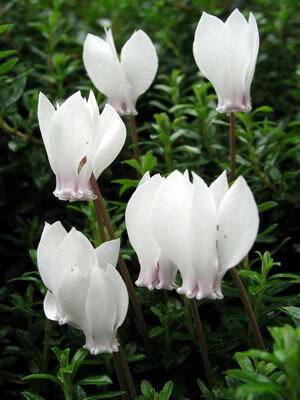 This form has yellow stamens and style but these can also be cream. 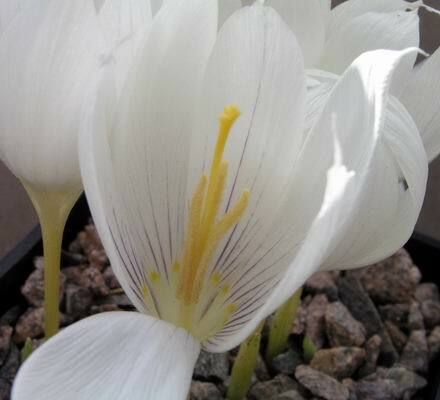 Crocus vallicola comes from N.E. Turkey and the Caucasus where it often grows close to the yellow C. scharojanii (log 31). Crocus scharojanii flavus is clearly a hybrid intermediate between these two species. 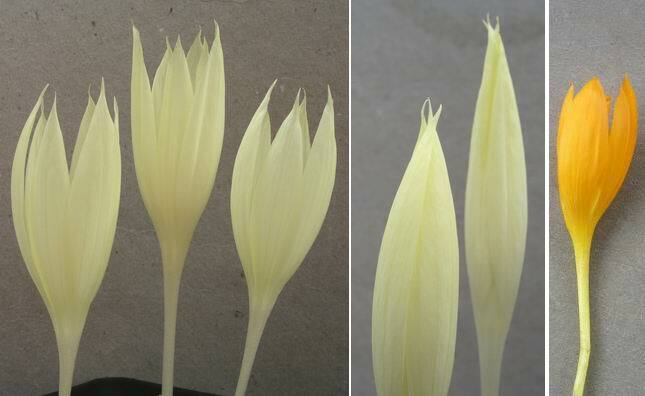 On the far right is Crocus scharojanii and to the left Crocus scharojanii flavus which shows the acuminate tips to the segments, like C. vallicola, and the pale yellow colour is also a combination between that of the two parents. I find that this hybrid, Crocus scharojanii flavus, takes after C. vallicola in being easier to grow than Crocus scharojanii which seems more difficult to please in cultivation. We are still busy repotting the bulbs and one that always causes a problem is Muscari macrocarpum. 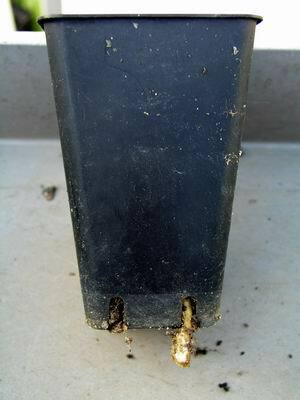 Because it is one of those bulbs that can have permanent thick roots it is very difficult to know when and how to repot without causing damage. 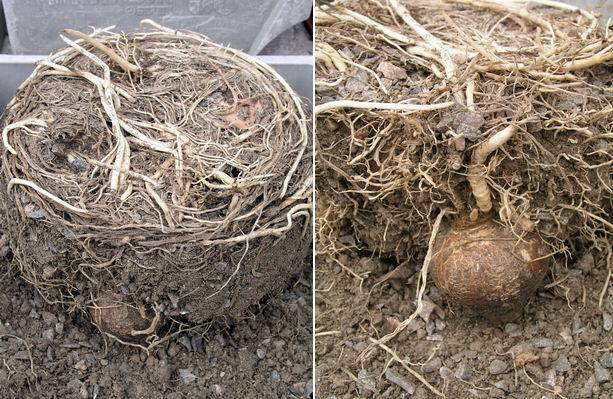 The bulbs will survive without out them but it is much better to try and keep them intact. We turn it out, leaving the clump up side down, and gently remove as much of the old compost as we can without disturbing the brittle roots. By using a paint brush, which is the best tool for this job, we can remove enough of the old compost to allow us to place it back into the same pot and still allow room for some new compost to be added. As I have said before I do not repot bulb seedlings until at least their second year of growth and when I do I always take careful note of how deep the young bulbs are growing. These Frit. 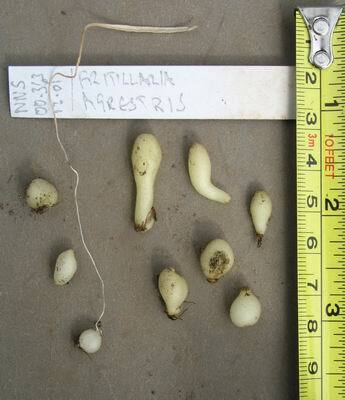 agrestris seedlings were 9cms down to the top of the bulbs showing just how deep they want to be. It is all too easy to think that because they are wee they will struggle to get to the surface if you plant them 'too deep'. In my experience you can never plant them too deep, even if you put them at the bottom of the pot their leaf will find its way up. This is never truer than with Erythroniums when you will find that both seedlings and full sized bulbs try to escape from even the deepest pot. 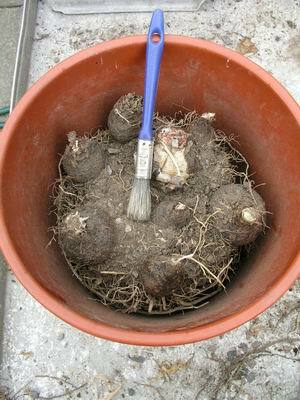 Care is required when lifting pots of Erythronium bulbs. When you lift them up always look at the bottom before you lay it back down to see if there are any sticking out through the drainage holes. 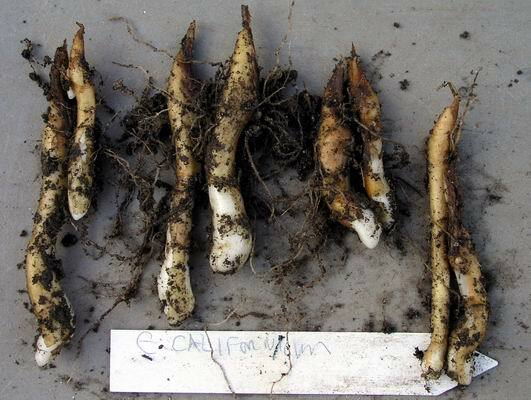 Erythronium bulbs are very brittle and if you do break one, plant all the bits and at least one, if not more, will grow into a new bulb. These are young Erythronium californicum bulbs and as yet un-flowered - see how long and narrow some of them are - they have adopted this shape to push themselves deeper into the compost. Ideally we should grow all erythroniums in the garden but because they go so deep it is not easy to lift and divide the clumps so we always keep some in pots. 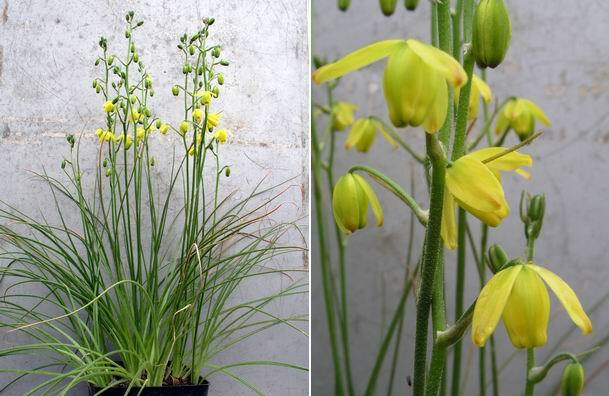 I was given a bulb of Albuca shawii some years ago to try and I must say that it has grown very well for me. 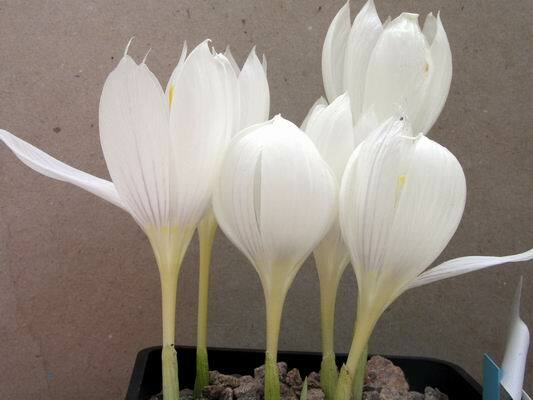 It helps extend the flowering season of the small bulbs through the summer. Native to the Natal and Lesotho (S. Africa) it likes a dry winter, I do not water it until March, then plenty of summer water will see it increase, flower and set seed. 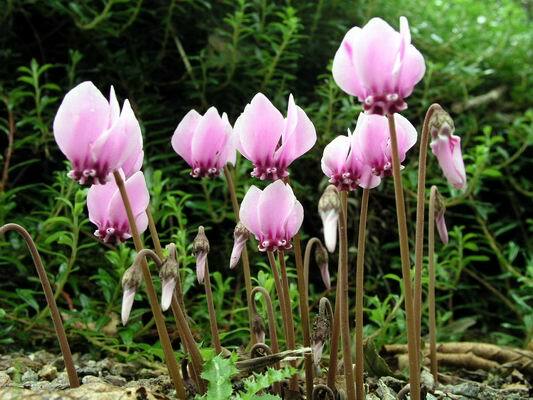 Many of the cyclamen are flowering in the garden now; Cyclamen purpurescens has the best scent of all. It likes to grow in our humus beds along with dwarf Rhododendrons. Cyclamen hederifolium prefers the slightly drier conditions of a gravel bed where the first of this years flowers are now appearing. 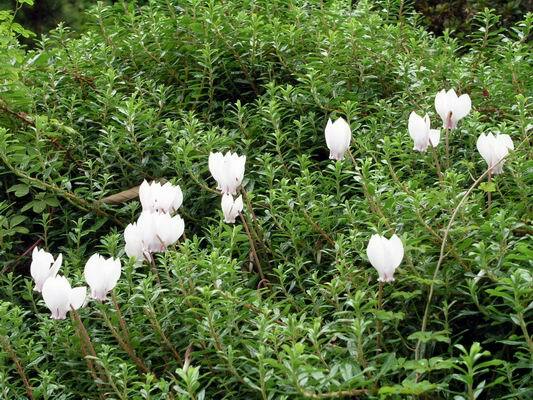 We have a nice form of Cyclamen hederifolium album which is planted in a wall that has been over grown by Salix hylematica. 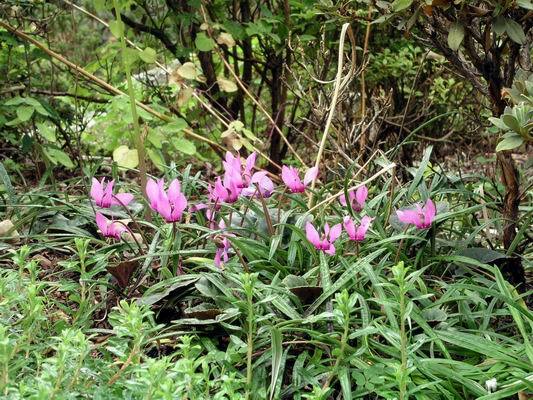 The cyclamen still pushes through and makes a very pleasing combination with the small shiny Salix leaves. The flowers are not pure white they still have a pink flush around the throat.